"When I was a little girl," says Chanell Kelton, "I used to tell my friends that my house is one of the oldest houses in Maryland." In fact, the two-story home where Kelton took her very first steps was built around 1875. It was the first house built in what became the free African-American community of Jonesville. It's in rural Montgomery County. Named after its founders Richard and Erasmus Jones, ancestors who Kelton lovingly referred to as her "uncles," the community gave former slaves their first concrete taste of freedom. "During the holidays in what we would call the old kitchen, we would always have our holiday dinners," Kelton, 32, recalls. "Just sitting down and having that meal in the original part of the house was a very spiritual moment. It felt like our ancestors were right there with us." That home was acquired in 2009 by the Smithsonian's National Museum of African American History and Culture. It has been rebuilt as part of an exhibition. It is called "Defending Freedom, Defining Freedom: The Era of Segregation." Visitors are able to stand inside of the house. It was a symbol of pride and possibilities for a family that once worked at a nearby plantation. The Smithsonian staff calls it the "Freedom House." "Written on its very bones was a giant symbol for freedom, for rising up, for coming out of slavery, for putting a stamp on the world that signified standing tall in the era following enslavement," says curator Paul Gardullo. "It has two floors. That was the thing that stood out to us as well, the way in which it stood apart and separate from what would be thought of as a slave cabin. It was a home, a tangible symbol of reconstruction. It evokes the aspirations as well as the limitations of that period." Gardullo says evidence shows that Richard and Erasmus Jones, who may have been brothers, were enslaved on the Aix la Chapelle plantation. That is in Montgomery County, Maryland. About 5,400 enslaved people were held there prior to the Civil War. The first parcel in the Jonesville community was bought by Erasmus in 1866. That was the year after the war ended. Gardullo says Richard Jones bought the land where the "Freedom House" stood about nine years later, for $135. That is according to a deed in Maryland Historical Trust files. Jonesville is now located within the city of Poolesville. It was among many all-black settlements that cropped up in the area, including Jerusalem and Sugarland. They joined other such communities around the nation including Rosewood in Florida and Nicodemus in Kansas. Gardullo says the construction of the house and the surrounding buildings help tell the story of how people who had been enslaved could build a home, like other Americans. They had the skills and wherewithal to do this in a country where they were second-class citizens. The Jones-Hall-Sims House, named for the related families who lived there over the years, is much more than simply the story of a single, beloved house. "It's the demonstration of a way of life that many people in America have sort of forgotten in the stereotypical story of African-Americans that many have. A story that goes like: slavery, sharecropping, urban ghetto, when it's way more complicated than that," Gardullo muses. "You've got these communities that were being created and sustaining themselves and living off the land despite economic challenges and political challenges and racial violence in some cases." The original house is a log building. It measures approximately 16 by 25 feet. The way it was built tells historians what the Jonesville community was like. It was crafted from hand-hewn logs from Maryland. The logs were joined by hand. There was a kitchen, what Kelton calls the "old kitchen," along with a chimney and fireplace. It was whitewashed on the inside and outside and had a wooden floor. There was an upstairs level and windows on that level as well. "All of these things let us know the community was filled with black artisans who could do this, who were skilled at creating and constructing their own complex structures," says Gardullo. "But having a home with two stories where you could look out over your land is more than just a sense of pride of ownership. It's also a view to know that if there is someone coming down the road, and if you had a gun, somebody could be sitting up there watching the land." Kelton says her grandparents told stories about the original inhabitants of the house. It was a place where huge family reunions and pig roasts were held every year. Her grandfather continued the tradition of black artistry in the town. He was a craftsman in the construction field. Kelton says she loved growing up walking the paths of her ancestors. She ate fresh food from the garden. Fruit trees were planted by the home. "It was just a wonderful experience, being surrounded right there in nature, walking through the same woods where my ancestors walked, seeing the same trees, feeling the same grass," Kelton says. "I know my ancestors and grandparents are very thankful. I can just see them smiling down now. So I'm grateful for the fact that the Smithsonian is helping to keep the legacy and the spirit of the Jones-Hall-Sims House alive." Why does the cabin have two floors? The Smithsonian staff calls it the "Freedom House." "Written on its very bones was a giant symbol for freedom, for rising up, for coming out of slavery, for putting a stamp on the world that signified standing tall in the era following enslavement," says curator Paul Gardullo. Gardullo says Richard Jones bought the land where the "Freedom House" stood about nine years later, for $135. That is according to a deed in Maryland Historical Trust files. Gardullo says the construction of the house and the surrounding buildings help tell the story of how people who had been enslaved could build a home, like other Americans. The Jones-Hall-Sims House, named for the related families who lived there over the years, is much more than simply the story of a single, beloved house. "You've got these communities that were being created and sustaining themselves and living off the land despite economic challenges and political challenges and racial violence in some cases." The original house is a log building. This article talks about an enslaved house that is still standing today. One of the people that use to live there is still alive today. 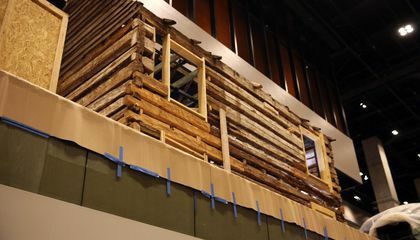 The cabin has two floors because there would be one family on one floor and then another family under it. In my opinion I think this house is a wonderful house for history. You can actually go in a house that has been standing for 150 years. I think it is really cool that she gets to live in her ancestors old home. I would love to have that historic monument in my family and be able to live in it. I think it is really cool too that she is able to live there. I would also love to have that historic monument in my family as well. I really liked this article because it is just like a ancient house renovated inside . It is nice how they preserved the outside structure of the house, it kind of gives you an idea how houses looked 1875. The cabin has two floors so the African Americans that are staying in the cabin are able to look down at the street below them. Also, a second floor might be needed if there was a lot of people that would be staying in the cabin. 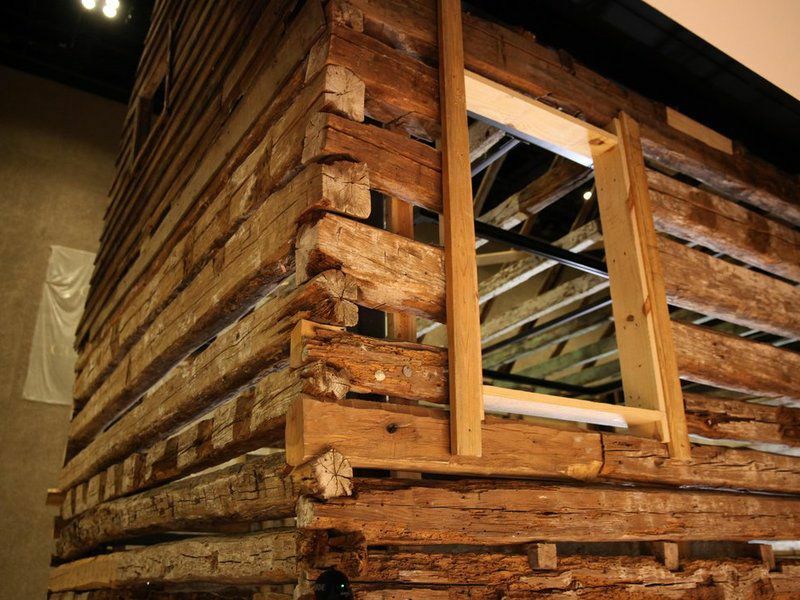 I think that it is really cool that the Smithsonian museum is using the cabin as an artifact; that is a good way for people to understand the troubles that African Americans went through. I agree that it is cool that they are making the house into a museum. The house has a lot of history about it and can tell us about the past. I think the cabin has two floors because they could hide from people in an attic who want to kill them. I would not like to live in a old cabin. I don't like the country at all. It has two floors because, you can watch for people that are coming to see if they are friend or foe. And it would be nice to see the scenery there. They have two floors so they can watch for good people or bad people.